At Surrey Marble and Granite, we work with kitchen fitters and designers to create beautiful, affordable kitchens for families around Surrey, Hampshire and Sussex. We can have stunning granite worktops, luxurious natural stone flooring or marble work surfaces installed in just a few weeks. 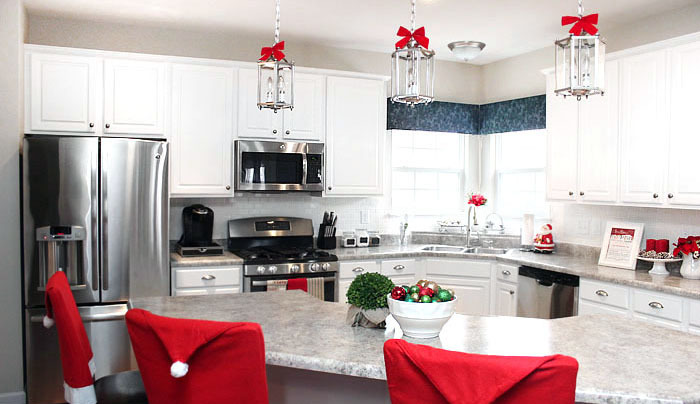 You’ll be cooking in a new kitchen by Easter or maybe even Valentine’s Day, and next Christmas will be a doddle. For many families, Christmas dinner is the biggest meal of the year, both in terms of the number of dishes prepared and the number of guests invited. As our extended families grow, it’s becoming harder and harder for small old kitchens to rise to the challenges of a festive meal. Flexibility is key here, particularly if you have 20 guests for a festive meal but less than five around the table on ordinary days. Creating a kitchen that can handle such a big shift in food preparation patterns is easy if you choose high-quality and robust materials. Granite worktops are a great choice as they’re food-safe, heatproof and easy to clean. This means that you can roll out pastry and make bread directly on the worktop. It’s a great way to get kids involved, and certainly saves on extra dishes. Having a clean surface you can put food down on is a great boon when your kitchen’s particularly busy, and a wipe-clean surface is a must! If you’ve ever spent a party putting coasters under drinks or fretted every time you see a splash of water on your worktop, then natural stone is a great choice for you. Heat-resistant, stain-resistant and water-proof marble and granite worktops can handle almost anything life throws at them. You won’t have to worry next time you see someone put a hot cup of tea – or even a hot saucepan – down without a mat. Of course, it’s not just the people – you have to find space for all the extra food and drink, as well as the plates and glasses to serve it in. Using stone in your kitchen can be a great way to free up space for more efficient storage. Granite worktops won’t bow, which means they need fewer supports so you can create more effective storage. Off-cuts make great floating shelves, which are ideal for storing attractive items – like your best china – in sight but out of reach. High shelves are a great way to use awkward spaces, including over doors and windows.